Ground Penetrating Radar Systems, LLC. 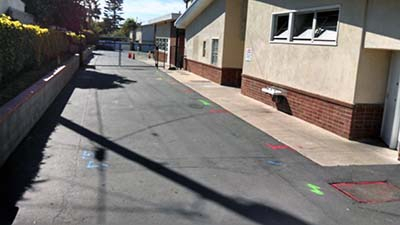 - GPRS of California was contacted by a construction company to locate all utilities within their boring bath at an elementary school in Ventura, CA. They were to directional bore from an existing communication vault into the school property to provide time warner cable services. We used two methods to find utilities, first we used radio detection and found power lines and we also hooked on to tracer wires to find the gas that feeds into the school. We also used Ground Penetrating Radar to find the water lines and sewer lines. We were also able to provide depths for all findings and used spray paint to mark the ground where utilities were embedded. GPR is a great tool to scan areas of post tension cables, rebar, and conduits, including PVC pipes and can also be used to locate underground utilities prior to digging or excavating. Please contact Ground Penetrating Radar Systems (GPRS) to learn how we can assist with your project. 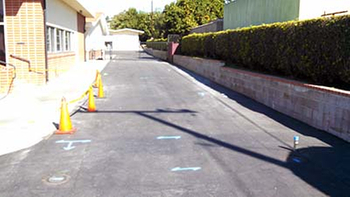 To locate rebar, post tension cables, conduits, pipes or utilities in concrete or underground please contact us today. GPRS has offices throughout the entire state of California and we have completed projects in cities such as: Ventura, Santa Barbara, Thousand Oaks, Westlake, Malibu, San Fernando Valley, Los Angeles, Irvine, Glendale, San Diego, Riverside, Pasadena, Torrance, Orange, Anaheim, Long Beach, Lancaster, Palmdale, Bakersfield and San Luis Obispo. Please contact Freddy Espinal at (805) 729-5877 or alfredo.espinal@gprsinc.com to learn more about Ground Penetrating Radar and how GPRS can assist in your projects.